If you’re looking for the gift that keeps giving, the Affordability Discount Program (ADP) might be for you. The program works by discounting a portion of the service availability charge for electric and natural gas every month for qualifying customers. The service availability charge, covers the cost of metering and billing, regardless of energy consumption. The program was introduced to our customers as a way to reduce their monthly energy bills. ADP participants save up to $12.30 a month and up to a $147 a year depending on whether they live in an all-electric home or have a combination of both gas and electric. Since 2008, more than 49,000 customers have enrolled and have saved a total of $4.8 million this year alone. Raul Preciado is just one of the many customers taking advantage of ADP. Customers on the ADP see their discount each month on the back of their bill. For a full breakdown of your bill, click here. 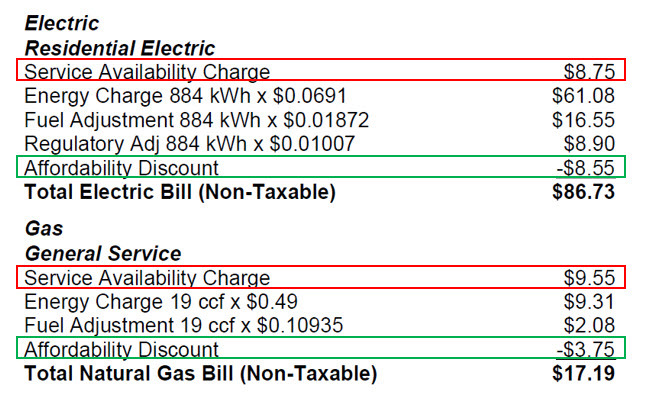 Sample bill with Affordability Discount for a customer with electric and gas service. To be considered for the program your income must be at or below 125% of the federal poverty guidelines shown below. Guidelines show the number of people living in home and their combined income before taxes. If you feel the Affordability Discount Program is right for you and would like to apply, we make it easy with an online form. So, take a few minutes and give yourself a gift that will put money back in your pocket every month.